Valerie Sherry, 2015 David M. Schwarz Architects Traveling Fellow from the University of Maryland recently completed her travels through India and Turkey before starting her 10-week internship here in our Washington, D.C. offices. Valerie will be heading back to the University of Maryland to complete her Master of Architecture program. We caught up with Valerie to talk about her experiences traveling and working at DMSAS. Why did you choose your particular destination(s)? For my thesis, I’m investigating formal and informal learning environments and how architecture can stimulate curiosity, enrich learning, create common ground and expand access to education. My research agenda and some key texts helped me determine that India and Turkey were appropriate contexts in which I could conduct field research and meet with local innovators in the field. 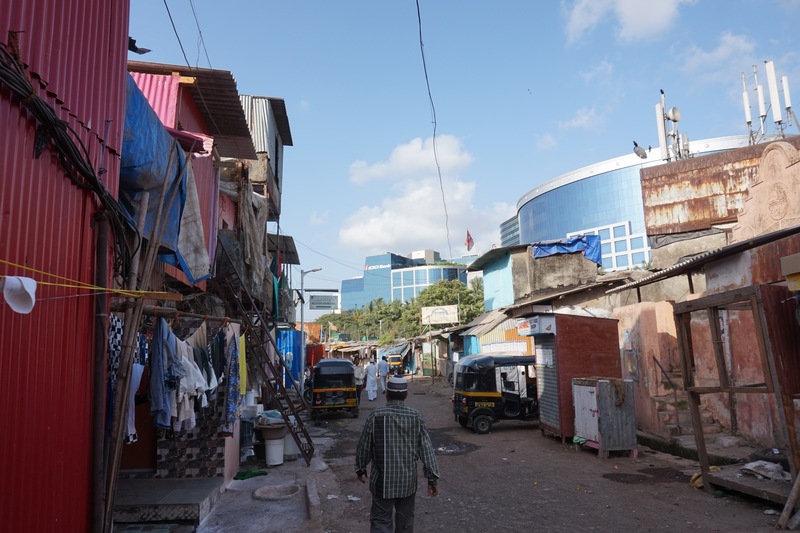 India’s position as the second most populous country (along with the incredible density of citizens in New Dheli and Mumbai) allowed me to survey how informal economies and learning networks have been created in high-density urban settings. In Istanbul, and elsewhere in Turkey, I was able to visit vibrant urban incubation hubs where I met with groups who programmed and designed entrepreneurial learning spaces. I wanted to use the architecture and use-pattern of the bazaar and marketplace as a precedent to study architecture that can generate curiosity and activity. What techniques did you use to document what you saw, and how do you think they helped you to understand the architecture? Depending on the circumstance and the time I had to spend in each place, I used different mediums to record information and visually represent the places and spaces I visited. 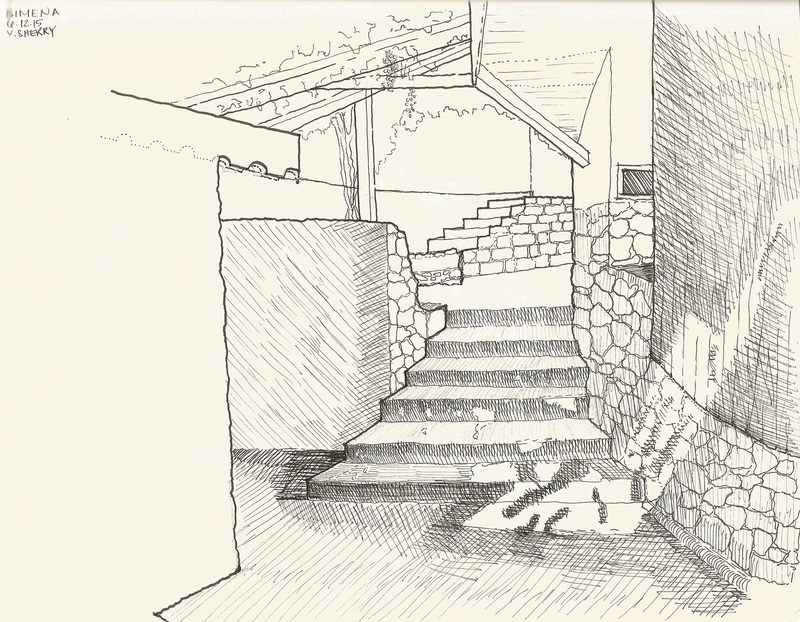 I found that when I took time to pace out, observe and return to spaces at different times of day, I began to understand the buildings or spaces even more when I drew them. I found assemblage, or collaging, to be useful when synthesizing key takeaways from a building or space I visited. I used assemblage to speculate about how these spaces might relate to my thesis agenda. For me, drawing helps me record information and assemblage and charcoal drawing help me to remember the feeling of a space or place. Photographs, not to be forgotten, also reveal new insights each time I look at them. How did the history, traditions, or politics of the place you visited influence the architecture you documented? While traveling in India, there was a constant juxtaposition of timeless ancient sites and changing modern infrastructure. Everywhere I looked I could see a conflation of ancient and modern tradition. Where the ancient and modern met in the physical realm differed depending on the context. In some places, I witnessed a gradual overlap and palimpsest of history in the built environment. In other places I saw a clearly intentional distinction between old and new as manifested in the boundaries set up between these environments. Politics influenced each place I visited in different ways. Perhaps this was most evident in Mumbai where the politics of development were plainly visible in the built environment of the city. An example of this is the hutments in urban villages which were built before the year 2000 are considered legal and those built after the year 2000 are considered illegal. The political implications are nuanced when developers are seeking to build new high rises. Many skyscraper new-construction projects are situated either next to a slum or next to a mid-rise apartment building that was mandatory to build for urban village/slum residents in exchange for using the land where they had previously lived to build the new luxury building. What was your favorite building, place or space? 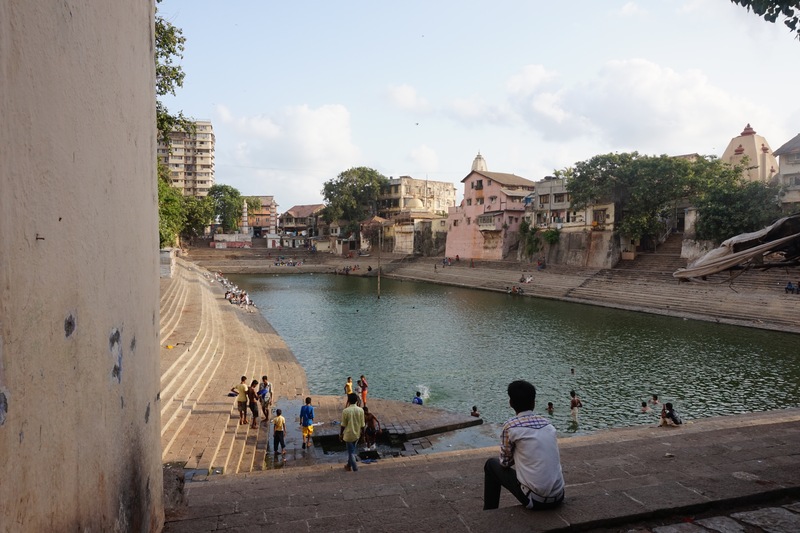 Banganga Tank is a place that can be difficult to find without the help of a local resident of Mumbai. This sacred place is a peaceful oasis and water sanctuary in the middle of the bustling megalopolis. It is a place of worship with a rich historical and religious heritage and is a pilgrimage site for Hindus. According to Hindu myths, the god Rama shot an arrow that pierced the ground and yielded fresh water. Geographically the site is located on top of a freshwater spring. The tank, and specifically its water, have been known to have healing and purifying qualities and can be used for ritual bathing. Beautiful ancient stone carvings can be found in subtle locations, carved into the side of the wall. Steps descend into the sacred water tank on all four sides and reveal traces of past water levels through their time-stained discoloration. 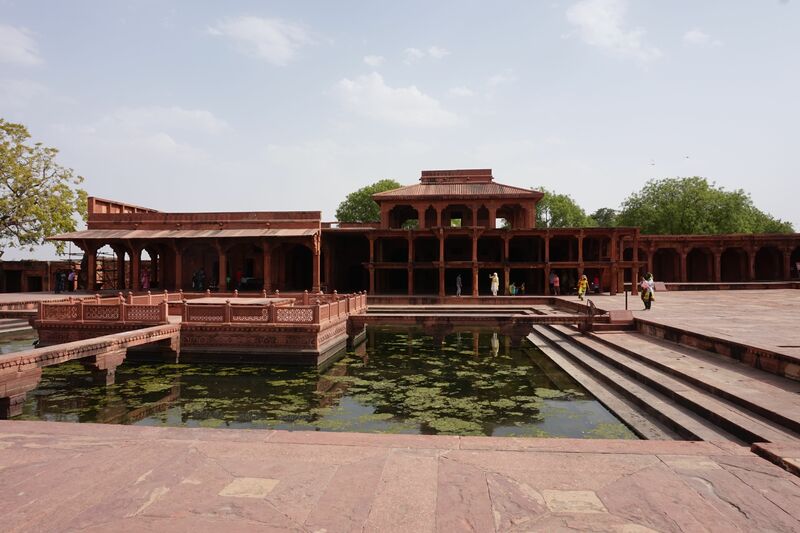 My favorite buildings were from the abandoned city, Fatehpur Sikri. Was there any architecture that was particularly moving/inspiring/depressing or that resonated with you emotionally? 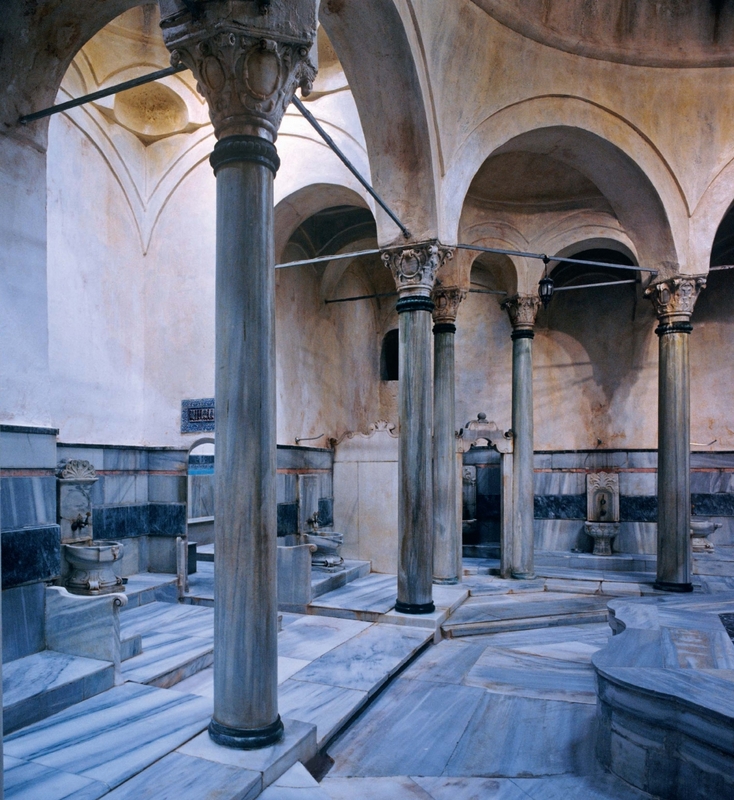 The architecture of the bathhouses in Istanbul was awe-inspiring due to their sense of place, age value and their architectural detailing. Calming patterned light speckled the space. One bath, called Cemberlitas, was particularly beautiful to visit. It was built by the architect Nurbanu Sultan in the 16th century. In Istanbul I looked closely at public bath architecture, public markets, bazaars and more formal educational settings, like universities, to consider the spaces people gather in or gravitate towards. What was the most valuable lesson you learned during your ten-week internship with DMSAS? So far, the most valuable lessons I’ve learned is that ideas can come from anywhere and to trust the process of design. I’ve also had a window into the organization and coordination it takes to keep drawings up to date and coordinated and how to push ideas forward into systematic documentation. One of the lessons working at DMSAS has reiterated for me is that throughout this process of design, coordination and “architectural accounting”, it is paramount to ensure design intent is maintained and the design options are still explored. What was your favorite souvenir of your travels, either purchased for yourself or something chosen as a gift? The charcoal drawings and the sketches made in my notebook are my most treasured souvenir of my travels. 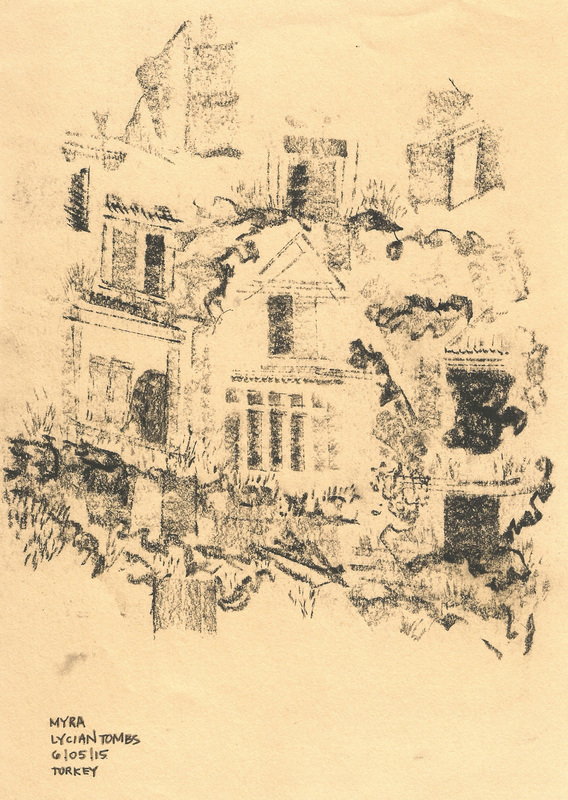 These drawings remind me of conversations sparked with others through drawing and they remind me of the spaces and places I experienced and will be able to use as a catalog of precedents in the future. I learned the great value not only of the product of the documentation, but also the process, thought and analysis that occurred while documenting sites. What was your most interesting culinary experience on the trip? This is a hard one to choose! Food was a deeply ingrained part of the travel experience in each place. Eating Indian Thalis is a delightfully interesting experience because the food keeps coming until you are full! Thali plates differ depending on which Indian region or state they are from. Many urban residents originally traveled from their homes in villages across India to work in the city of Mumbai. Delhi and Mumbai are thus melting pots of Indian cultures and so I got to taste many different kinds but I especially liked Gujarati Thalis. There’s a lot of research and preparation that goes into proposing the itinerary for travel, so fellows often already know a good bit about the places and buildings they’re visiting before they get there. What was one thing that left you completely unprepared/surprised? 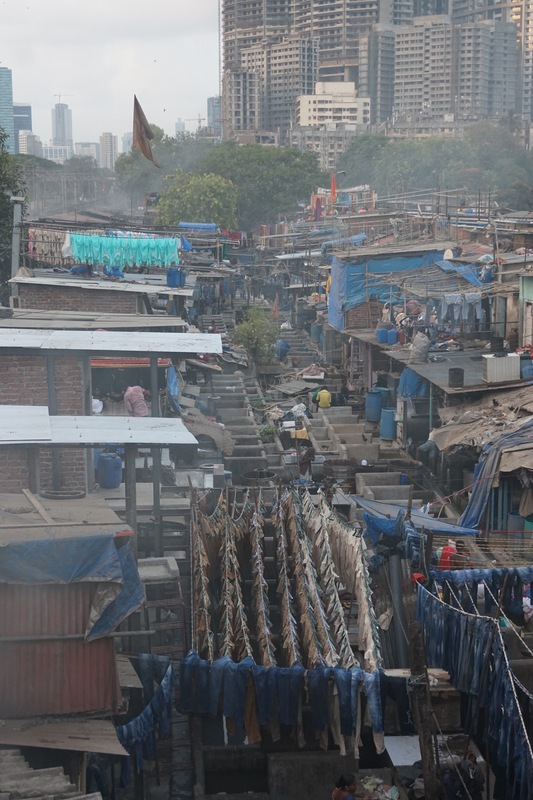 Dhobi Ghat is one of, if not the, world’s largest open air washing machine. Its physical footprint is massive and exists in the center of Mumbai and represents a crucial portion of industry. Every hotel in the area sends its laundry to this place and if you send your clothes out to get “dry-cleaned”, this is likely where they are washed. I was unprepared to see with my own eyes, such a degree of organization and efficiency at such a massive physical scale. I was also unprepared for just how much one can communicate with others even if we are not fluent in each other’s languages. I formed great trust with several people I encountered while traveling. Usually conversation was sparked by people interested to see what I was drawing. Two individuals I met had an incredible story when they explained they were part of a group called the Dabbawallas. As it turns out, they are couriers in a highly respected, complex delivery system that logistics managers worldwide still cannot comprehend. Dabbawallas deliver millions of home cooked meals from homes to office workers every day throughout the city of 19 million. It was impressive hearing how many times these meals change hands before they are delivered to their final destination. 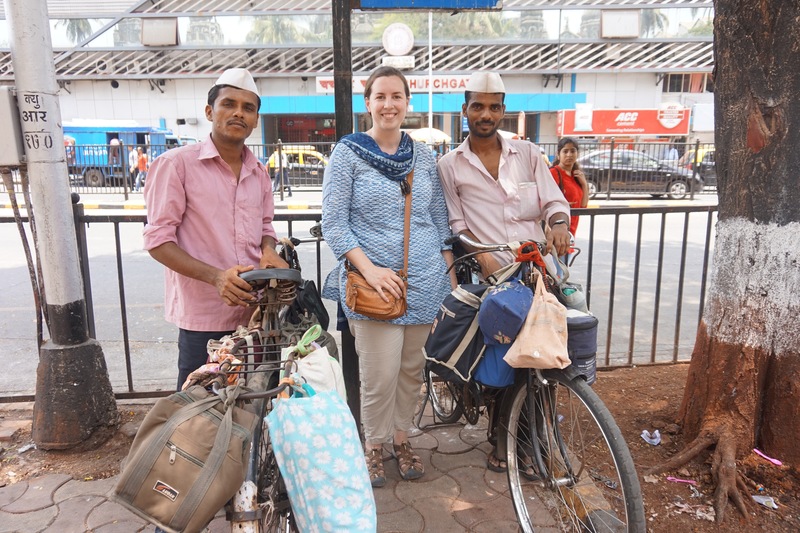 What shocked me the most was hearing about the trust Dabbawallas have within their teams and the general respect people have for the work Dabbawallas do. They leave their to-be-delivered meals on the street, knowing that no one will steal them because no passersby wants to interrupt their progress. Instead, bikes holding the meals are left on streets and other members of the Dabbawalla team pick these up for final delivery. To check out past Travel Fellow Q&As, click here. check back often, we will posting more Q&As from 2015 Travel Fellows in the coming weeks.